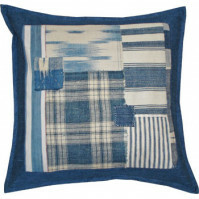 Fabulous and Chic cushions & accessories made from antique & vintage textiles. Limited quantity, each item is individual and unique, keep checking these pages for new stock. Vintage Striped Cushion. !00 percent Cotton. Duck Feather inner pad. MAD..
Vintage Welsh Dragon, filled with highly fragrant organic lavender. 28 cm x 19 cm .. Antique linen and cotton ticking cushion 45 cm x 45 cm Backed in off-white ant..
Vintage Katazome Stenciled cushion Hand-loomed, indigo dyed. Duck feather pad ..
Vintage Hand-embroidered cushion 45 cm x 45 cm Cotton/Linen Duck Feather P.. Antique Patchwork 45 cm x 45 cm Duck feather insert Dry Clean ..